Golf fashion is making its way from the greens to the catwalk. And then it hopes to sashay right into the boardroom. At Gurgaon’s Golden Greens Golf & Country Club, the venue of The Expat Golf Cup, professional models plan to hit the ramp on 28 October, showing off the latest range of the Greg Norman Collection of apparel and accessories that made its Indian debut earlier this month. 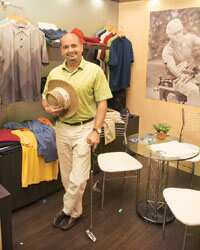 It’s believed to be the first time that a golf brand will be displayed at a fashion show at a golf event, says Rahul Singh, chief executive of Better Than Before (BTB), the sole licensee of the Greg Norman Collection in India. Usually, these end-of-tournament shows feature ethnic wear, are more tilted towards glamour than the sport itself, and few, if any, sports apparel brands see promotion. The fashion show will feature shirts, shorts, caps, sweaters, jackets and gloves, ranging from Rs800 to Rs10,000. The Greg Norman range isn’t the first golf apparel and accessories brand to hit the Indian shores. Puma Sports India Pvt. Ltd took the lead earlier this year, using brand ambassador Kiran Matharu, a British teenage golfer of Indian origin, to launch its products. Reebok India Co. announced its line a few weeks ago. But BTB wants to be seen and counted among golfers of all shades. On Friday, it showcased the Greg Norman range at the country’s first golf exhibition, the Asia Golf Industry Show, in New Delhi. It’ll follow this up with the ramp walk in Gurgaon. The exhibition is basically a window to newcomers and “aspirational" golfers, who want to take up the sport, but have no clue about how to go about it. The Expat Cup, held in Singapore, Malaysia and Dubai apart from India, opens up new audiences, too: embassy staff, chiefs of missions and heads of various United Nations departments and world organizations, including business enterprises, participating under the flag of their respective countries. “Expatriates are a global community, they travel all over…we, too, are a global brand, selling in over 21 countries," says Singh. BTB, which plans to set up 10 exclusive Greg Norman Collection outlets by July 2008 in India and increase this to 50 over the next five years, has also signed an agreement with the PGA European Tour to outfit golfers such as international star Ernie Ells at the Indian Masters, scheduled for next February. Earlier this month, players at the Bilt Open 2007 similarly turned out in the Greg Norman range. BTB has also begun tying up with corporate houses for kitting their teams or the events and initiatives they sponsor. Among these are Optima Sports, marketers for the Indian Golf Union, publishing company Living Media India Ltd for driving Golf Digest subscription, the Indian Oil Corp. Ltd golf team, kitting of the Hewitt Associates (India) Pvt. Ltd team, DLF Golf Resorts Ltd for the DLF Masters and RN Golf, for the Ballantines invitational golf event in Mauritius. Singh reckons the Indian sportswear market is growing 20-25% annually, with the sports lifestyle sector “significantly". But what worrieshim is that the fastest growing sport in India requires high investment, and is not really accessible to everyone; India has under 300 courses compared with about 25,000 in the US. Golf, he concludes, remains a lifestyle sport in India, and not a mass sport. His message for young professionals, especially those in the information technology and financial sectors: play golf—or at least look like you do—to survive in the business.